Seven stand up dolls use pictures, cut outs, brilliant colors, and different facts to create images of seven famous influential African American women. From actresses to activists, from poets to TV hosts, from entrepreneurs to philanthropists, these women each made a difference in their own way. Represented within this exhibit are Rosa Parks, Maya Angelou, Anita Hill, Madame C.J. Walker, Harriet Tubman, Sojourner Truth, and Oprah Winfrey. Reaching around the world and traveling in time to the past, the present, and the future, dramatic and informative exhibits illustrate women at work in a variety of settings. Photographs, exhibits and engaging activities introduce visitors to the fun and excitement of math, science, engineering and technology (MSET), present practices that support learning MSET skills, illustrate that women have been successful in the area of MSET throughout history, and demonstrate how MSET skills expand career options and are essential for daily life in a technological society. The United States has been collecting meteorites in Antarctica for over 25 years. The rocks are located and collected by a small team of scientists who establish a tent camp in a chosen location on the East Antarctic Ice Sheet. The meteorites are handled carefully to prevent contamination and are then shipped to NASA Johnson Space Center for analysis and classification. Scientists world-wide are then notified of the collection and can request small samples for further research. Currently there are more than 12,000 meteorites in the US Antarctic Meteorite Collection. This exhibit explains why scientist look for meteorites in Antarctica, the process by which they are handled, and what can be learned by studying them. Photographs from a recent expedition will be displayed. ANSMET is a joint venture of the National Science Foundation, NASA, and the Smithsonian Institute. Developed by Dr. Diane DiMassa, Professor of Engineering, Massachusetts Maritime Academy. Dr. DiMassa has been to Antarctica on two separate ANSMET expeditions. This exhibit illustrates that MSET skills support creative endeavors, especially in the area of jewelry design. Interactive activities allow visitors to learn about the many artists skilled in MSET and individuals skilled in MSET who are artists. Developed in conjunction with the Attleboro Jewelry Makers. Illustrations, narrative and curriculum will illustrate "How to Make Math Real" by utilizing aerobics and fitness as a means of supporting a better understanding of mathematical vocabulary and concepts. The integration of the mathematics vocabulary with physical activity will help participants to actualize the mathematics while at the same time promoting health and fitness. 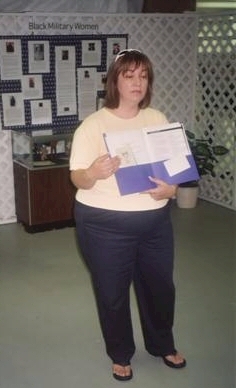 Developed by Karyl Resnick, Coordinator of the After-School & Out-of-School-Time Programs (ASOST), Massachusetts Department of Education (MADOE), and Sandra Dale, certified fitness instructor and a registered orthopedic physical therapist, with guidance and support from Margaret Helgaard, educational specialist at MADOE and a former math teacher. The “Women Doing Physics” display was created for the Centennial of the American Physical Society (APS) in 1999. A collection of photos, both historical and modern, depict women physicists actively pursuing their craft. The historical photos were selected from the collection of the American Institute of Physics’ Emilio Segrè Archives. The modern photos were snapshots contributed by readers and friends of the Committee on the Status of Women in Physics. Sponsored by the American Physical Society. This exhibit illustrates educational practices that support learning science by setting high expectations, providing supportive learning environments, and giving students opportunities to apply what they have learned at North Attleboro High School. Students represented in this exhibit have participated in the Regional Science Fair, Massachusetts State Science Fair, and International Science and Engineering Fair (ISEF) and other science competitions. They have earned numerous accolades in science. Exhibitors include Pooja Shukla: North Attleboro High School graduate, MIT graduate. ISEF, State Science Fair, and Regional Science Fair participant, Junior Science and Humanities Grand Award winner, Navy Nationals Award winner, North Attleboro High School graduate. Her awards have taken her to San Diego, North Carolina, Montreal, and London. Jillian Berry: Senior at North Attleboro High School. ISEF, State Science Fair, and Regional Science fair participant. Ranked first in her class at North Attleboro. Currently accepted to MIT.Gina Algelosanto: Senior at North Attleboro High School. State Science Fair and Regional Science fair participant. Ranked in top 5 of her class at North Attleboro. Currently accepted to MIT. Kasia Whitting: Junior at North Attleboro High School. ISEF, State Science Fair, and Regional Science fair participant. Developed in conjunction with David Vito, North Attleboro High School (NAHS), Science Department and NAHS students. Photographs and narrative provide a glimpse into the past and present science experiences of North Attleboro resident Tara Bennett. A focus on how her current efforts at Harvard University are two-fold: working with high school students to foster an excitement for doing science and bringing teachers up to date on the newest discoveries in the research areas of the Harvard faculty. Developed by Tara Bennett, Coordinator of Harvard University's Molecular and Cellular Biology and Howard Hughes Medical Institute (MCB-HHMI) Outreach Program for high school teachers and students. Sponsored by the MCB-HHMI Outreach Program. Blanche Ames made her mark on events in Massachusetts and across the United States. Her skills as an architect, engineer, and artist are illustrated throughout the mansion she designed located at Borderland State Park in North Easton, Massachusetts. As a leader in the Massachusetts Suffragettes, she used her skills as an illustrator to gain support for a woman’s right to vote. Developed by the Friends of Borderland State Park. Learn more about Blanche Ames. 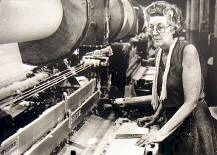 The Women at Work Museum “Call for Photographs” was coordinated by the International Association of Administrative Professionals (IAAP), Crossroads Chapter. Selected by a jury, photographs portrayed women as intelligent decision makers using math, science, engineering and technology. Photographers were from Massachusetts, Rhode Island, and Tennessee. Subjects included students and professionals at work in construction, education, community service, engineering, and publishing. Settings varied and work sites include the Gilbane Building Company, Houghton Mifflin, New England Medical Center, Norton Community Playground, Oak Ridge National Laboratories, State Ballet of Rhode Island, Bates College, and the Norton Middle School. 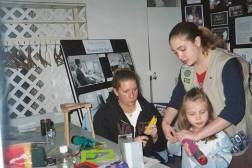 On Saturday, March 13, the Women at Work Museum was bustling with the sounds of the Attleboro area girl scouts at work. These girl scouts, ranging from daisies to seniors, about six to fourteen, were busy presenting their exhibits and workshops in math and science, based on the museums on-going theme of Women in Math, Science, Engineering and Technology. Their hands-on, creatively displayed activities engaged many kids, who found the building and playing and general “messing around” fun and informational. Ms. Dee DeForest, President of the Service Unit for Girl Scouts in Attleboro, and Ms. Chris Pepper, Troop Activity Consultant for the Service Unit of Attleboro, organized this event. About eight different exhibits were set up, with plenty of daisies, brownies, cadets, and seniors to run them. The exhibits ranged from taking apart and rebuilding household tools to following the path of oxygen as it travels through the bloodstream. “Girls Invent”, the sign reads. Around the table are four or five kids, busy at work. Eight-year old Ryan, for example, took apart and put back together a dustbuster “mostly by myself.” Six-year old Samantha built a “robotic arm”. 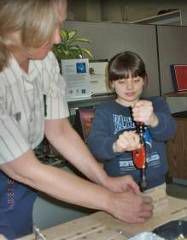 She had to “drill holes into tongue depressors” with the help of Kathy Gasbarro, the adult working the station. She points out a poster, covered in pictures of famous inventors, which stands behind the table, but most of the kids are engaged in building, gluing, constructing their own toys. The next table, called Senses, seems to be one of the most fun. Melissa, leader of Brownie troop 152, tells me that they are “having a ball”. 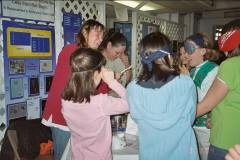 Blindfolded, the kids use their senses of smell, touch, and taste to distinguish what they are being given or fed. Although I’m tempted to join in, I move to the set up behind this one. Hidden in the darker alcove, this exhibit is labeled “Lights and Mirrors”. The senior girl scouts use light, mirrors, and prisms to delight and amaze the younger kids. “You can change the color of the light with colored paper,” Rebecca says. All the kids are intrigued by the “magic” the girls are making, so I slip out and move to the next exhibit. “Bags of Tricks”, complete with puzzles, anagrams, and an assortment of games, is run by Christine Curran and Melissa Messere. Living representation of the Women’s Vietnam Memorial Washington DC was presented by area high school students when the Museum opened in 2003. This image was a focal point in the Leaders in Peace and War exhibit presented in 2004. Participants Captain Joyce Masselo, USAF ( retired) and Andrew Goldberg (No. Attleboro) holding the flag, students in representation include Ty Graham, North Attleboro High School, Chris Howard, North Attleboro High School, and Ashley Nerz, North Attleboro High School., Sabaa Chaudary, Attleboro High School. Production of the large scale image for the exhibit was coordinated by Alan Goldberg of North Attleboro and donated by ICL Imaging of Framingham, MA. This exhibit explores a 501(c)(3) nonprofit organization using brochures, pictures, and other informational pamphlets. Created in 1996 by the Teresa Heinz and H. John Heinz III Foundation, this organization is dedicated to helping women secure a retirement income as well as educate the general public about the inequalities present in the current system. On Saturday May 29, 2004, the dedication of the WWII Memorial was a national salute to the generation who won WWII. It is important to honor those who serve. The “Leaders in Peace and War” was an exhibit dedicated to the honorable service of women from the Colonial Period to the present. This exhibit clearly illustrates the efforts women made to ensure freedom during WWII and in other conflicts. Free and open to the general public, the opening reception was hosted by American Legion Auxiliary Post 20 & Post 312. 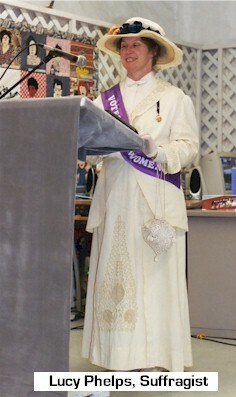 Following the reception, a slide presentation featured the history of women in the military. One member of the exhibit committee noted, “I have worked with women veterans for over 10 years and have often found it to be true that their military service has gone unrecognized, unrewarded, and most certainly undocumented. I am pleased and honored to be a part of the development of the exhibit "Leaders in Peace and War - Honorable Service of Women" which will inform people of the courageous and dedicated women who have served our country since the Revolutionary War.” Patricia Robinson, LICSW, Women Veterans Program Manager, VA Boston Healthcare System, Boston. The Easton Historical Society presented this engaging and informative display that features documents and artifacts from the Revolutionary War through WWII. 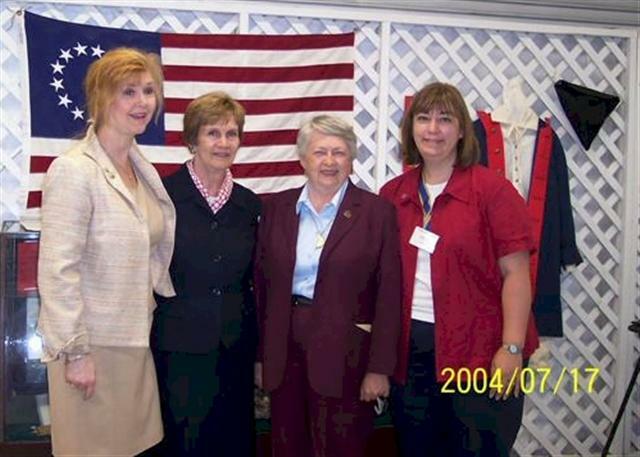 Contributions of women from Easton and members of the Ames family demonstrate their commitment to supporting the troops. Coordinated by the Easton Historical Society, Easton Massachusetts. 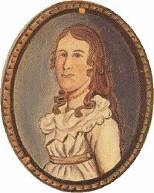 Deborah Sampson, born in Plympton, MA, enlisted in the Continental Army during the spring of 1782- dressed as a boy. Unfortunately she was found out- but she did not give up hope and again enlisted under the name Robert Shurtliff in Bellingham, Massachusetts. After being wounded several times and nearly left for dead, a doctor in the army helped her win an honorable discharge from the Continental Army. She went on to marry and start a family, descendents of whom still reside in Massachusetts today. This exhibit describes her life. This exhibit also includes the life of another brave woman, Hannah Dustin, who rescued herself from the clutches of a dangerous group off Native Americans, and the first woman to ever have a statue erected in her name. Developed by the Sharon Historical Society, Sharon Massachusetts. Portrait of Sampson, circa 1780 - Wikipedia. When Cathay Williams enlisted in the army, women were not allowed to serve as soldiers. Therefore, Williams posed as a man, and joined the Thirty-Eighth Infantry. As a result, she became the first and the only known female Buffalo Soldier. Williams was born into slavery in Independence, Missouri in 1842. She worked as a house slave for William Johnson, a wealthy planter in Jefferson City, Missouri. She worked for him until his death. About the same time, the Civil War broke out and she was freed by Union soldiers. From thereafter, she worked for the Army as a paid servant. While serving the soldiers, she experienced military life first hand. She served Colonel Benton while he was in Little Rock, Arkansas. She also served General Sheridan and his staff, and was later recruited to Washington to serve as a cook and laundress for them. While traveling with them, she witnessed the Shenandoah Valley raids in Virginia. After leaving Virginia, she traveled to Iowa and then went on to St. Louis. Throughout her time working for the Army, she also had the opportunity to travel to New Orleans, Savannah, and Macon. 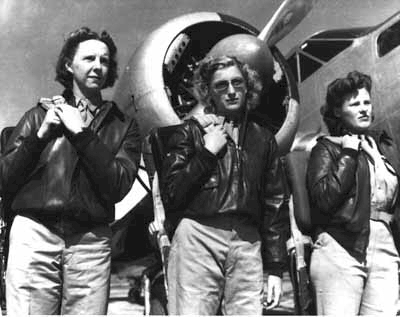 After the war, Williams wanted to be financially independent so she joined the army. In November 1866, she enlisted as William Cathay in the Thirty-Eighth United States Infantry, Company A. She was able to do so because a medical examination was not required. Only her cousin and a friend were aware of her real identity. Company A arrived at Fort Cummings in New Mexico on October 1, 1867. At the fort, Williams and her company protected miners and traveling immigrants from Apache Indian attack. While serving in Company A, there was insubordination among some of the troops, but Williams was not involved in the incidents. In 1868, Williams grew tired of military life so she feigned illness. She was examined by the post surgeon who then discovered that she was a woman. She was discharged October 14, 1868. A display of documents, objects, photographs and narrative tell of the heroic efforts of Clara Barton, "Angel of the Battlefield" during the U.S. Civil War, and her post-war work to heal the personal wounds of that conflict. This exhibit focuses on her life and work. While she championed the work of the women suffragettes, she dedicated her life to humanitarian causes, and this exhibit uses pictures, posters, and letters to show exactly how extraordinary this woman truly was. Information illustrated Clara’s long and successful career as a correspondent and her battlefield service nursing wounded soldiers. In 1881, Clara founded the American National Red Cross, her enduring legacy. Developed by Cathy Woods, Clara Barton Birthplace Museum, Emily Thomas, Nichols College, and Jean Garde Parker, Women at Work Museum. Beginning with the Revolutionary War, displays featured uniforms and period dress worn by women during the Civil War, WWI and WWII, Vietnam, Gulf Storm and present day conflicts. 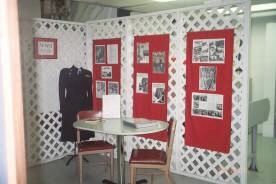 Displays included photographs, personal histories and memorabilia. Along with combat nurses, the American Red Cross, the National Guard and other branches of the service, WASP (Women Airforce Service Pilots) and the US Air Force are represented in an inspiring display, which portrays women aviators from WWII to the present. 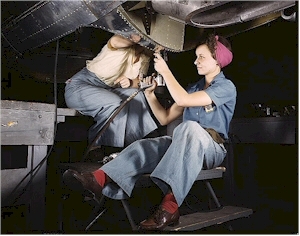 Photographs, narratives, and artifacts illustrate those women who broke barriers in the air. 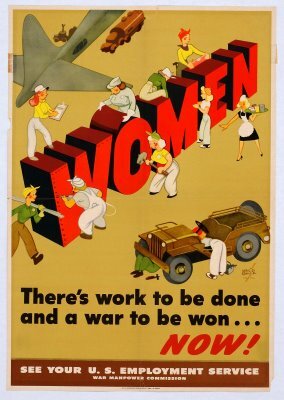 Developed by the Women at Work Museum in conjunction with veterans organizations, Leaders in Peace and War Exhibit Committee, Naval War College, and the Massachusetts National Guard Museum. For centuries, toy makers have created dolls that represent women leaders. 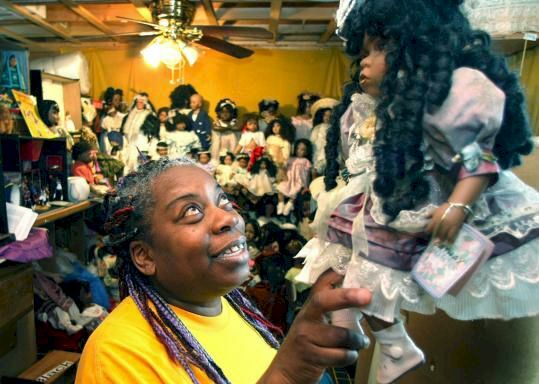 Deborah Britt and her four sisters, Kareena, Felicia, Chantell, and Jerilyn, have over 8,000 dolls of color. For the exhibit “Leaders in Peace and War,” they selected a collection representing black women from the Colonial period to the present, including Harriet Tubman and GI Jane. Doll collectors, historians and visitors of all ages found the dolls interesting and engaging elements of the exhibit that illustrate the important role toys play in teaching children and youth about history. Presented by Deborah Britt, Mansfield Massachusetts and the Passionate Doll Collectors Club (PDCC) of Metro Boston. Her Military Decorations and Awards - General Vaught is the President of the Women In Military Service For America Memorial (WIMSA) in Washington, DC - only major national memorial honoring women who have served in our nation's defense during all eras and in all services. General Vaught’s numerous military decorations and awards include both the Defense and Air Force Distinguished Service Medals, Air Force Legion of Merit, Bronze Star Medal, Meritorious Service Medal, Joint Service Commendation Medal, Air Force Commendation Medal with Oak Leaf Cluster, Joint Meritorious Unit Award, Vietnam Service Medal with four service stars, Republic of Vietnam Gallantry Cross with palm and Republic of Vietnam Campaign Medal. Following retirement, General Vaught, worked as a consultant with the Strategic Defense Initiative Organization as well as with industry. A reception followed at the Museum. The hosts of this event were the Norton VFW Fillmore-Nason Post 8049 Auxiliary. 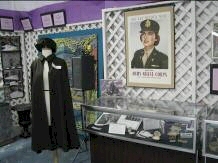 Women in the Air-WASPS (Women Air Force Service Pilots) and the US Air Force are represented in this inspiring display about women aviators. 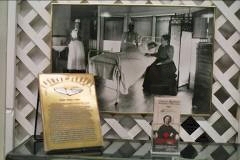 Combat Nurses-videos, oral histories and photos demonstrate the bravery of women who served as nurses. WIMSA-On loan from the Women's Memorial in Washington DC, are uniforms, photographs, letters, military orders, newspaper articles, and other documents that depict the honorable service of women in the military beginning with WWI. 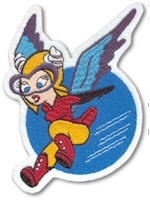 The mascot for the WASPs was Fifinella; cute, agile, and always ready to take up the flying challenge. This epitomized the spirit that was the WASP who served this country very well in a time of need. Their contributions are documented and stand for spirit that made this country the great nation we are. Two pictures hang, both of young women, one dressed in furs and frocks, the other in military camouflage. This exhibit asks us to probe within ourselves- which might we be, had we been born into different times, and how might we, as people, be different in another time? This wool and linen uniform was worn by the continental soldiers during the American Revolutionary War. Along with it is information explaining its versatility and its use in the war. This exhibit focuses on the creative ideas used for recruiting women to fight. From “The Navy wants you” posters to popular army songs such as “Bing! Bang! 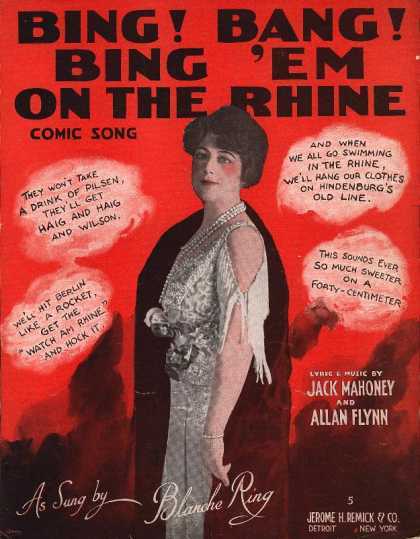 Bing ‘em on the Rhine”, “My Rainbow Ribbon Girl”, and more. Also included in this exhibit are collages about the Waves, with information, and posters about the nurses in the army, and the difficulties they went through. Other artifacts representative of women in the navy are scattered around the room. This exhibit covers women in World War II. Barbara Warren, a current resident of Attleboro, illustrates the life and duties of the Women Accepted for Volunteer Emergency Service with pictures, newsletters, and even an actual uniform. Quotes from former President Dwight D. Eisenhower demonstrate his influence on war, and the pacifist views he held, even after he had fought in war. 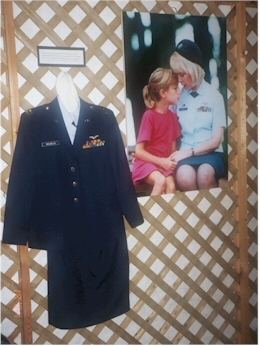 The uniform of Lieutenant Elizabeth Stearns, a member of the Women’s Army Auxiliary Corps, along with information about her, is displayed as well. A picture of the Honorary Edith Nourse Rogers, who coauthored the GI Bill of Rights. 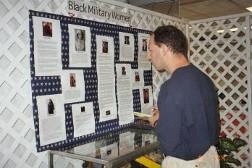 This exhibit displays pictures and information about women veterans from Massachusetts. It also offers information about the Women Veteran’s Network and the work it does for the Commonwealth of Massachusetts, as well as for its members. This exhibit displays a more local source of power. It focuses on the Attleboro area, and the different groups working to help children in the nearby area, from Christmas ideas to scholarships, and everything in between. It explores different ways any person can get involved, and be a part of “making a difference.” Also included in this exhibit is a history of the local paper, My Backyard, as well as a biography of a prominent local citizen who made a difference in the lives of children. Presented by the Greater Attleboro Council for Children, Inc. This mural depicts women making jewelry in Attleboro in the 1800’s. 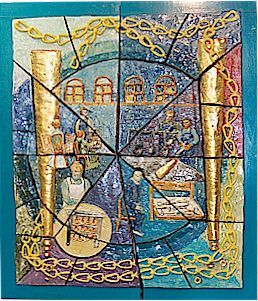 Included with this colossal mural are pictures portraying the women who made the mural, and how they did it, as well as an exhibit on jewelry making, including books about famous present day jewelers like Tiffany’s and Cartier. Old utensils hang on the walls, a scale used in prior days, and jewelry made in times before are all displayed, and the beauty of jewelry making can truly be discovered through this exhibit. 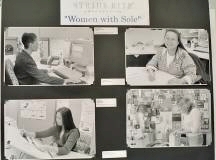 This exhibit displays books, articles, and magazines about women in different industries. “Men, their rights, and nothing more. This exhibit focuses on suffrage, and the women who helped secure that right for women to vote. From posters to cartoons to pins to binders, this exhibit uses many different methods to show the many different aspects of the female vote. 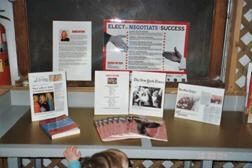 A book on display, Madam President, as well as another pamphlet, talks about the possibility of having a woman president, while another picture and newspaper clipping shows Afghanistani women voting and discusses that process. This fun and entertaining exhibit contains much information on the women’s suffrage movement as a whole, as well as the individual members who participated. Also included in this exhibit is a talking-voting machine, used by blind people, with information about the Braille system and how it is used currently. In 1995, the passage of the 19th amendment to the Constitution, giving women the right to vote, celebrated its 75th anniversary. The resolution calling for woman suffrage had passed, after much debate, at the Seneca Falls Convention in 1848, convened by Elizabeth Cady Stanton and Lucretia Mott. In The Declaration of Sentiments, a document based upon the Declaration of Independence, the numerous demands of these early activists were elucidated. The 1848 convention had challenged America to social revolution that would touch every aspect of life. Early women's rights leaders believed suffrage to be the most effective means to change an unjust system. By the late 1800s, nearly fifty years of progress afforded women advancement in property rights, employment and educational opportunities, divorce and child custody laws, and increased social freedoms. The early 1900s saw a successful push for the vote through a coalition of suffragists, temperance groups, reform-minded politicians, and women's social welfare organizations. Although Susan B. Anthony and Elizabeth Cady Stanton devoted 50 years to the woman's suffrage movement, neither lived to see women gain the right to vote. But their work and that of many other suffragists contributed to the ultimate passage of the 19th amendment in 1920. To put things into historical perspective, we've included a Womens Rights Timeline that chronicles the history of the women's rights movement. Today, that trust allows the League to continue to influence public policy. The League's impact is felt at all levels of government: local, state and national. The League's work is based on the belief that citizens who have well researched and unbiased information will make wise decisions for their communities and their nation. The League helps citizens ensure that their voices are heard at the local state and national levels and through coalition building around shared issues. The League of Women Voters Education Fund takes action in local communities to support public policy issues. In 1998-99, the Kaiser Family Foundation has partnered with state and local Leagues around the country to bring the public voice on Medicare reform to the National Bipartisan Commission on the Future of Medicare. Though the commission ended in deadlock, the League found a remarkable citizen consensus on applying the core values of fairness, access, responsibility and efficiency to public policy options. 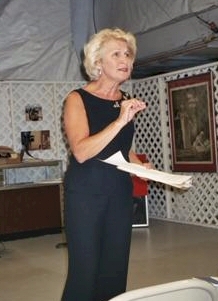 In keeping with the mission of the Women at Work Museum to promote economic independence, a series of financial education classes were developed by the Museum’s Board of Directors. Kelly Fox, Treasurer of the Museum and a Certified Financial Planner with American Express Financial Advisors, coordinated the classes, which were designed to be valuable to adults of all ages who want to manage their savings better, have a clearer understanding of financial planning in general and who want to have a better grasp of investment terms and strategies. All classes were presented free of charge at the Museum at 35 County St., Attleboro. Led by Financial Experts - The classes were designed to build one upon another. The classes included: Fulfilling Your Financial Dreams & Basic Banking and Credit Use, Understanding the Terminology of Investing, The Psychology of Money, Creating a Portfolio, Smart Women Finish Rich, Retirement Planning for Women ,Social Security, Insurance and Estate Planning. Representatives of many leading groups, organizations and financial institutions such as Women for a Secure Retirement in Washington DC, the Social Security Administration, Franklin Templeton, Van Kampen, Fidelity Investments and GE Capital were invited to speak on areas where they have proven authority. Kelly Fox, Treasurer of the Museum and a Certified Financial Planner with American Express Financial Advisors, coordinated the classes, which have been designed to be valuable to adults of all ages who want to manage their savings better, have a clearer understanding of financial planning in general and who want to have a better grasp of investment terms and strategies. The classes were free and open to the public and were funded in part by a grant given to the Museum by American Express Financial Advisors to purchase computer equipment and software for financial planning purposes. Below are the highlights form these classes. The first financial planning class was held on Wednesday, March 3, 2004 and covered two topics: Fulfilling Your Financial Dreams and Basic Banking and Credit Use. It was presented by Kelly Fox and Dondra Carvalho, Branch Manager of Fleet Bank in Attleboro. This financial planning class was held on Wednesday, March 24, 2004 and focused on the vocabulary of important terms and strategies used in investing. “Without understanding the terminology, it’s really impossible to make good investment decisions,” explains Fox. “Having a clear understanding of the terms and strategies will allow the class participants to begin to make better choices for themselves and their families.” Classes were held on the fourth Wednesday of each month through October. In this seminar, Stephanie Donaldson-Pressman, corporate consultant and author of Women, Wisdom and Wealth and Maxine Johnson, Senior Vice President of Fleet’s Private Clients Group presented a seminar on The Psychology of Money. Integrating the areas of psychology and finance, this workshop explored the ways in which our ideas about money are formed, the beliefs and behaviors that drive the management of our money, and provided some “pain free” suggestions on how to get a better handle on our finances. Presented by Kelly Fox, CFP®, Financial Advisor American Express Financial Advisors, Inc., this class covered the topics of understanding asset allocation and how to survive the volatility of the markets. Presented by Greg Burrill, Regional Vice President of Investments and Kelly Fox, CFP®, Financial Advisor, American Express Financial Advisors, Inc. This class focused on the specific roadblocks pertaining to women and investing, such as saving for long term retirement goals. The class included in depth discussions on several investment vehicles such as using individual stocks, bonds and mutual funds. Cindy Hounsell, Executive Director, Women’s Institute for a Secure Retirement, Washington, DC. (WISER) presented this class which focused on the following questions facing many women today: why is retirement such a challenge for women, how Social Security works and why it is so important for women, how to find out if you or your partner may be eligible for pension benefits, the basics of how to start saving and investing, including reducing credit card debt and information about divorce and widowhood and why they are often financially devastating for women. Presented by Kelly Fox, CFP®, a financial advisor with American Express Financial Advisors. The class on protection planning was designed as a follow up to last month’s class on Social Security. The series of financial education classes have focused on the urgent need for financial education to improve women’s ability to save and prepare for their goals, from basic savings to retirement portfolios. Presented by Lynn Pohl, Regional Product Specialist with General Electric Capital Assurance Company. The class on insurances discussed the importance of evaluating what needs to be protected and the options available for preserving assets in the case of an injury, illness or a death as well as life and disability insurance strategies, and long term care issues and answers. The class, was presented Deborah Blum-Shore, Esq. of the Shore Law Firm in Attleboro and President of the Bristol County Estate Planning Council. The class on estate planning was designed as a follow up to last month’s class on protection planning. Topics will included the importance of correct ownership and beneficiary designations as well as why a will isn’t the only document most people need to begin their estate plan.